Scotland’s many bridges are a sight to behold. From the ultra-modern to ones as old as the land they connect, admire the architectural and structural prowess evident within the most beautiful Scottish bridges and plan your next getaway adventure. A shining symbol of Scotland, the Forth Bridge is Edinburgh’s own Golden Gate. 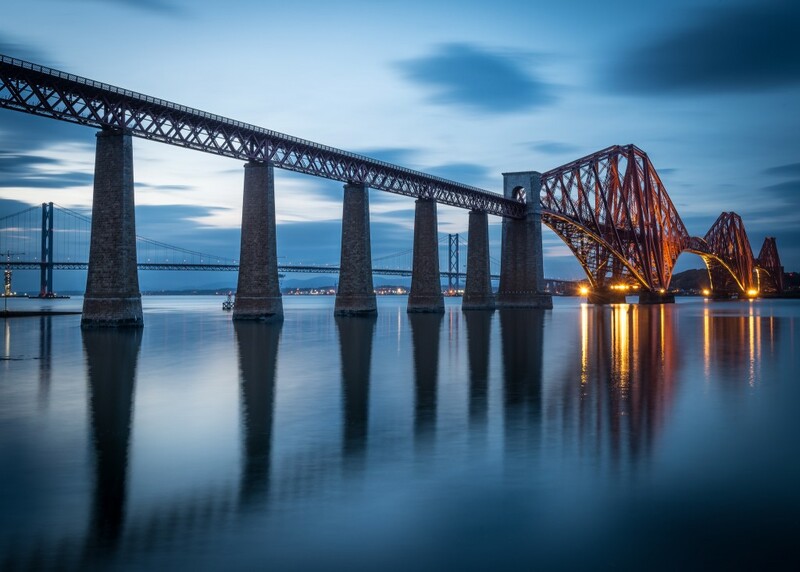 Made from steel, granite and 6.5 million rivets, this iconic cantilever railway bridge connects South Queensferry to North Queensferry and plays host to around 190 to 200 trains per day. This masterpiece was designed by Sir John Fowler and Sir Benjamin Baker and after opening in 1890, became the UK’s first major structure to be comprised of steel. Unsurprisingly, the bonnie Forth Bridge was voted Scotland’s greatest man-made wonder in 2016. It may be small but don’t let that detract from its celebrity status. Situated on the Old Course at St Andrews Links golf course, the Swilcan Bridge forms a shadow over the Swilcan Burn amidst the first and eighteenth fairways. To golfers, this wee Roman arch bridge is iconic and serves as a prime ‘Kodak moment’. Golfing champions and fans alike from far and near continuously make pilgrimages to this ancient bridge to pay their respects. At around 700 years old or more, the Swilcan Bridge was constructed for shepherds to guide livestock across the burn. 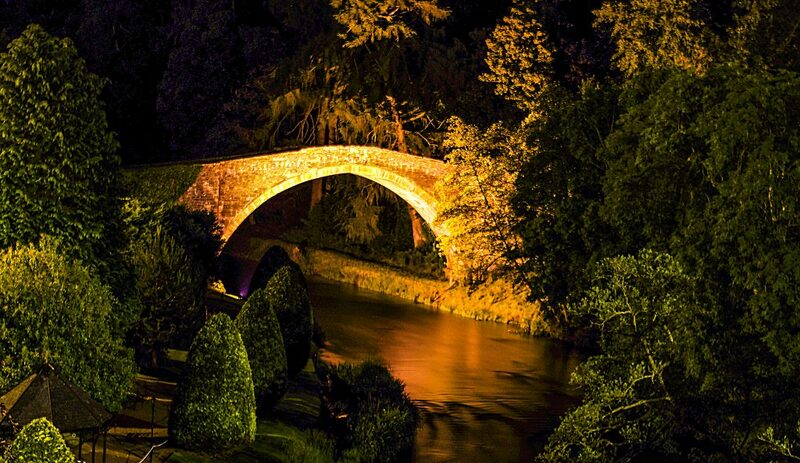 Ancient and stewed with history, the Brig O’Doon is a medieval steep humped single arch bridge in Ayrshire just a stone’s throw from Alloway. Dating back to the early 15th century, this evocative structure is renowned for playing a role in the last verse of Tam o’ Shanter, a famous poem by Scottish Bard Robert Burns. After setting eyes on a most disturbing demonic scene — a haunted church riddled with witches, warlocks and the devil playing bagpipes — Tam flees on his horse Meg, only to discover a witch is swiftly on their tails. Tam outrides the witch by escaping across the trusty Brig o’Doon. A permanent rainbow over Glasgow’s River Clyde, the Clyde Arc sports a curvaceous design. The off-kilter angled crossing adds to the innovative nature of the structure and is the reason locals refer to it as the ‘Squinty Bridge’! 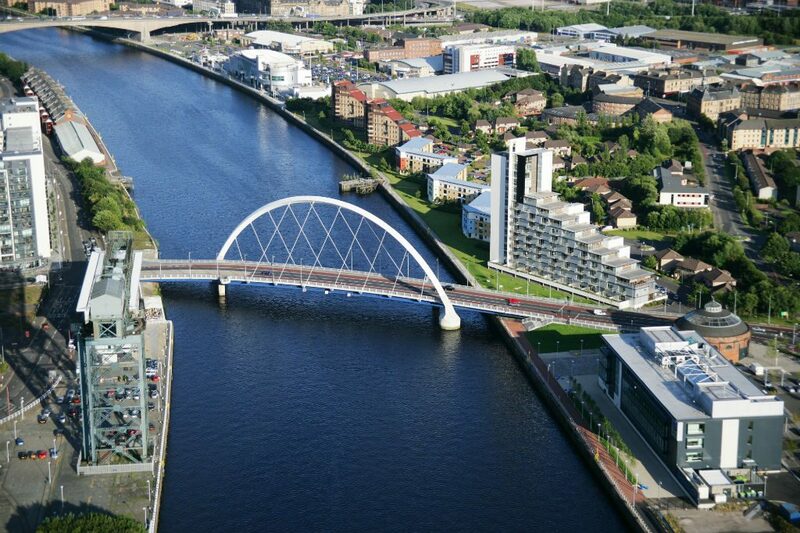 This modern marvel lit up Glasgow in 2006 and was designed to last for up to 120 years. Emerging out of the rolling West Highland countryside at the tip of Loch Shiel, the Glenfinnan Viaduct is perhaps one of the most photographed bridges in Scotland. 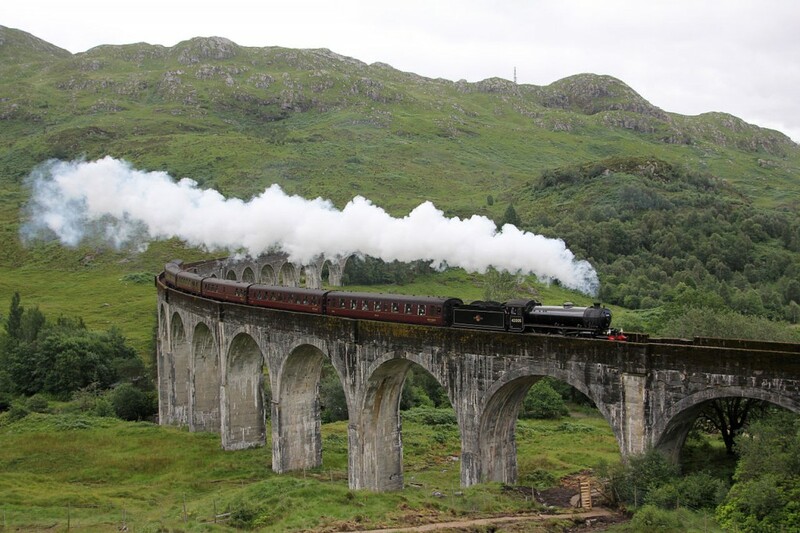 This is partly due to its multiple appearances in the Harry Potter films, and also thanks to its 21 impressive arches. This beautiful bridge, which opened in 1901, welcomes trains on the renowned West Highland Line and sports striking views to Loch Shiel and the Glenfinnan Monument. 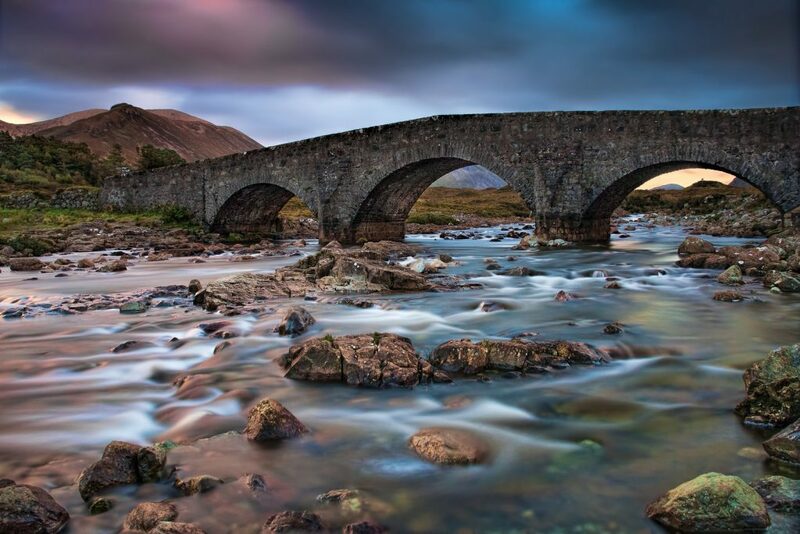 With a backdrop as dramatic as the enigmatic Cuillin mountains, it’s no surprise that the Sligachan Bridge is attached with folklore. This ancient wee bridge basks in a settlement on Skye and serves as a starting point for many climbers, adventurers and wanderers alike. 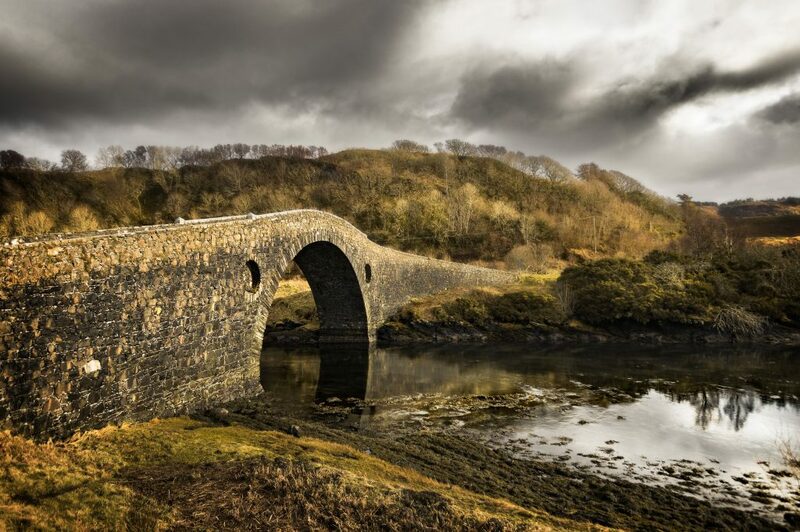 Providing a safe crossing over the enchanting Skye waters, the Old Bridge is a magical sight. Gazing at the many reflections of the Brig o’ Balgownie as they dance across the water never fails to create memorable moments of self-reflection. 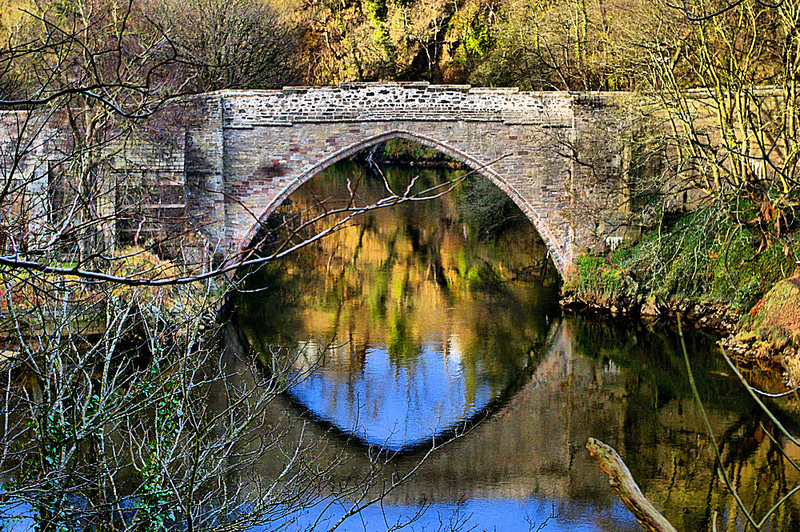 Once referred to as the Bridge of Don, the Brig o’ Balgownie dates back all the way to the 13th century and guards the River Don in Old Aberdeen. The bridge, with its lone gothic arch, was crafted from granite and sandstone and completed in 1320. From vast armies seeking a swift crossing to a prevalent trade route, this historic bridge has seen it all. Carved from concrete and sympathetically designed, Kylesku Bridge in Sutherland journeys over Loch a’ Chairn Bhain and serves as a replacement for the ferry service to and fro Kylesku to Kylestrome. This thin, almost alien like structure, which empathetically curves to morph in with its scenic surroundings, is a fine example of a box girder bridge. 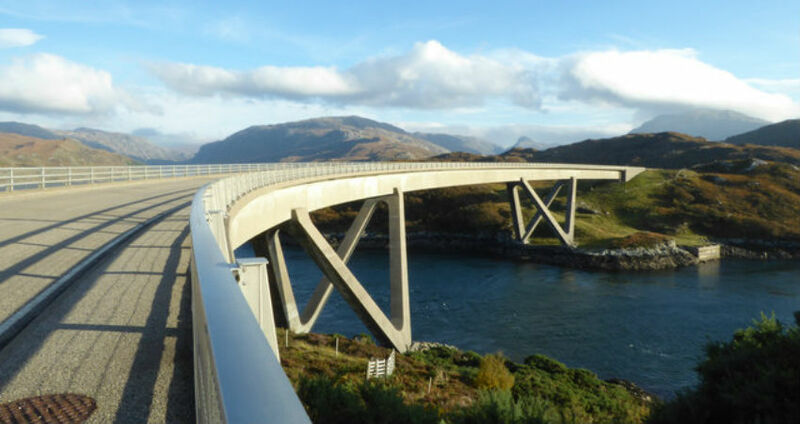 Subtle yet simplistically stunning, Kylesku Bridge opened in 1984 and is sturdy enough to weather strong Scottish winds reaching up to 100mph or more. Decorated by the occasional foxglove colony, the Clachan Bridge, which has been standing proudly near Oban in Argyll since the 1700s, is an absolute beauty. This resilient humped masonry bridge boasts a single arch and was built as such to accommodate large vessels, some even up to 40 tonnes. This picturesque structure crosses over the Clachan Sound, a body of water that meets the Atlantic Ocean at both ends. This is why the Clachan is fondly referred to as the ‘Bridge Over The Atlantic’. 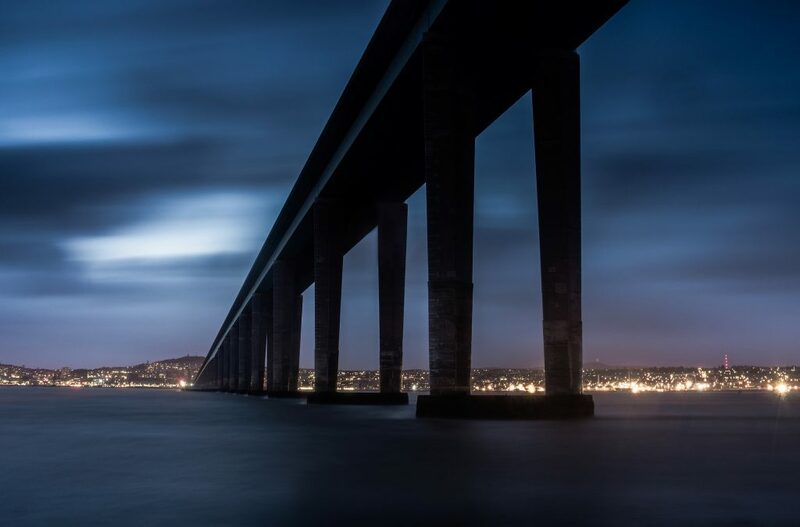 Hypnotic and impressive, the Tay Bridge rises up from the Firth Of Tay and provides a railway crossing between Dundee and Wormit, a suburb in Fife. The first Tay Bridge was part of an unfortunate incident and grave engineering disaster in 1879, when the whole structure collapsed into the water after high winds, taking down a train and passengers with it. The second bridge, which still stands today, opened in 1887, with the double-track crossing created from iron, steel, concrete and 3 million rivets. A substantial refurbishment project in 2003 helped spruce up the Tay Bridge, including the hand-removal of 1000 metric tons of bird droppings and replacement of hundreds of thousands of rivets.